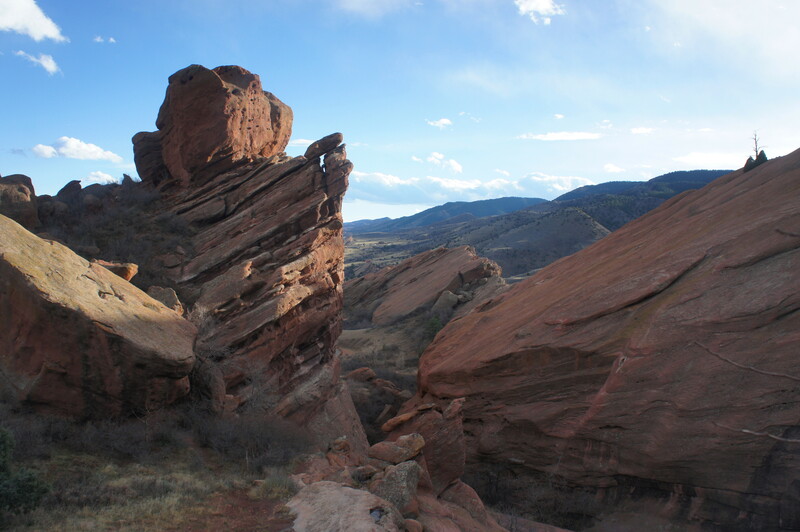 Rising abruptly from the dry prairielands at the base of Colorado’s Front Range, the ruddy sandstone outcrops at Red Rocks Park are a popular destination in the Denver area. 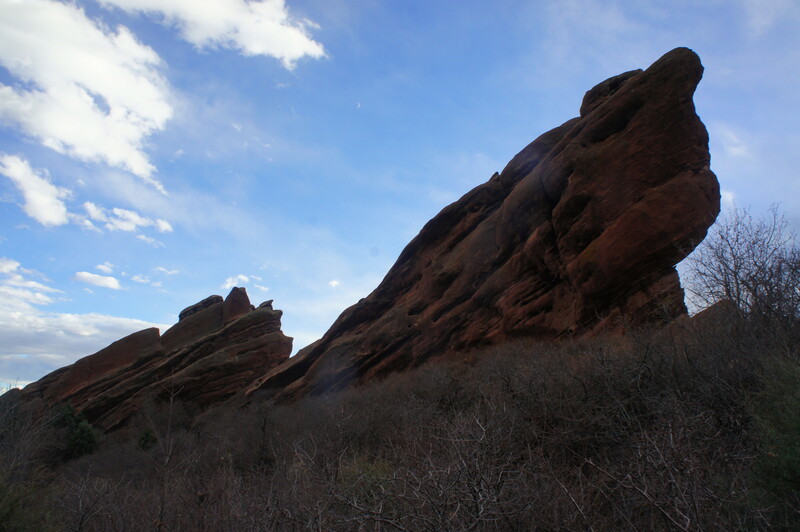 A short drive from the bustling metropolis, Red Rocks feels in some ways like an urban spectacle: the park is most well-known, after all, for its massive, man-made amphitheater, nestled among the stone. The 1.5-mile Trading Post Trail, however, offers a relatively rugged experience as it cuts across slickrock, skirts thick sandstone walls, and flirts with grand cottonwood trees. Best done as a loop, this hike never quite escapes the buzz of nearby roads, but it does offer a solid tour of the area’s unique geological landscape. 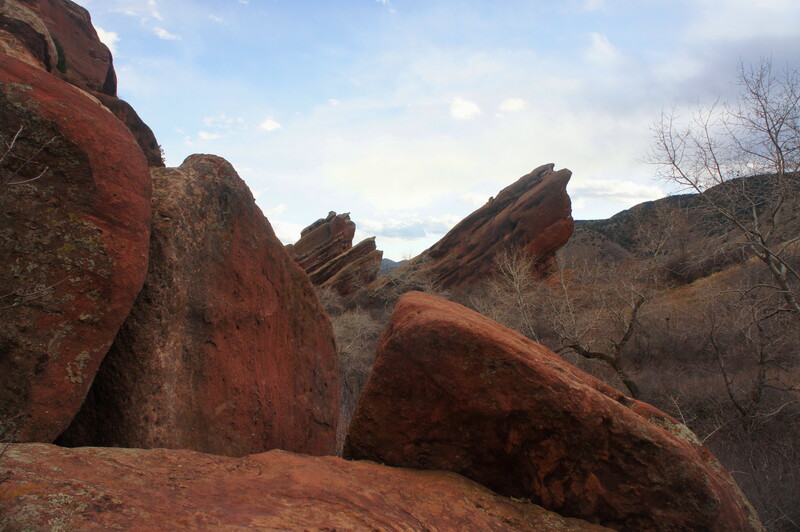 Red Rocks Park, roughly a 16-mile drive from downtown Denver, sits in a low valley between the slopes of Mount Morrison (7,881’) and a long, dusty ridge called the Hogback. The park is crisscrossed by paved, two-lane roads and littered with parking lots, and the somewhat gaudy Trading Post is a far cry from the serenity of Colorado’s famed mountain wilderness. Nonetheless, as the Trading Post Trail gets going (the start is situated at the end of the small lot east of the main building), the pavement gives way to dirt and slickrock, and hikers are plunged into a setting reminiscent of Utah’s spectacular canyon country. As the Trading Post Trail descends a steep slope, its skirts the eastern flank of Picnic Rock, a weathered jumble of stone. After winding through sand, the trail descends a wide sandstone ledge, with sweeping views of the valley beyond. 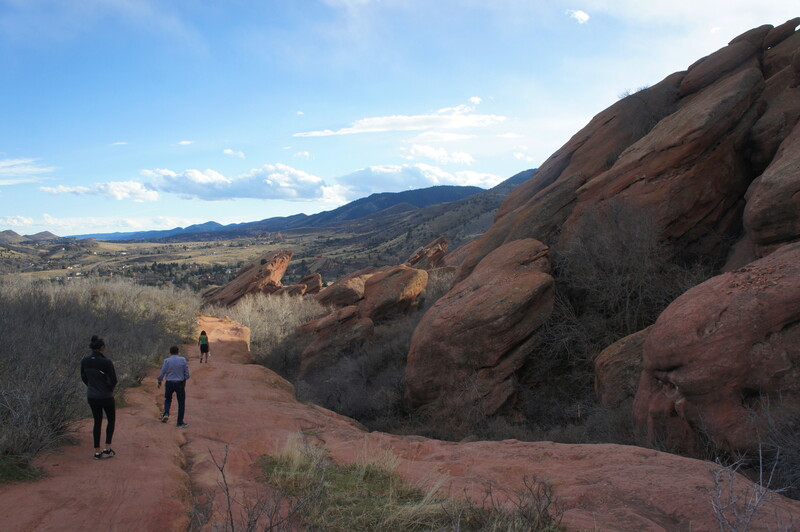 At about 2/10 mile, the trail crosses Red Rocks Park Road then hugs a grassy hillside as it continues to shed elevation. By around 4/10 mile, the path levels out and crosses a wooden footbridge over a brush-strewn wash. From here the trail approaches a small red silo, situated at the base of massive Park Cave Rock, which features sheer, vertical cliffs. 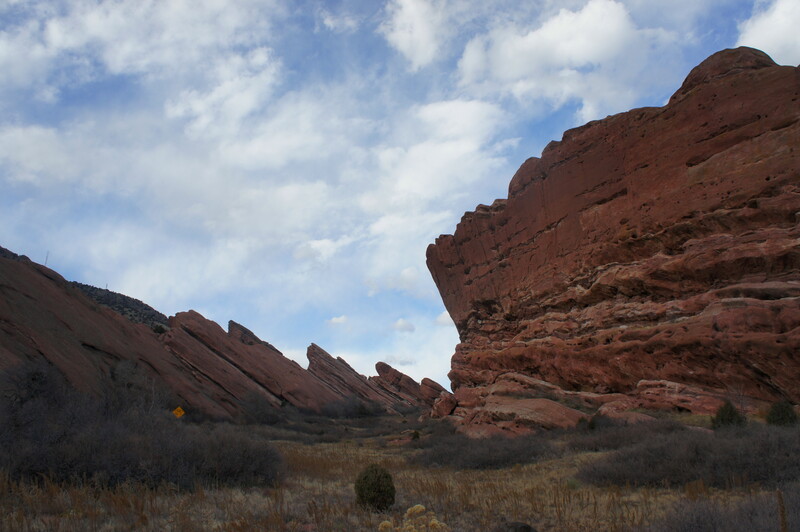 As the Trading Post Trail wraps around the rock formation bearing west, it crosses Red Rocks Park Road again. This is roughly the lowest point on the hike; it will be nearly all uphill from here. Cutting northwest across desert scrub, the next ¼ mile is fully exposed to the hot, midday sun. 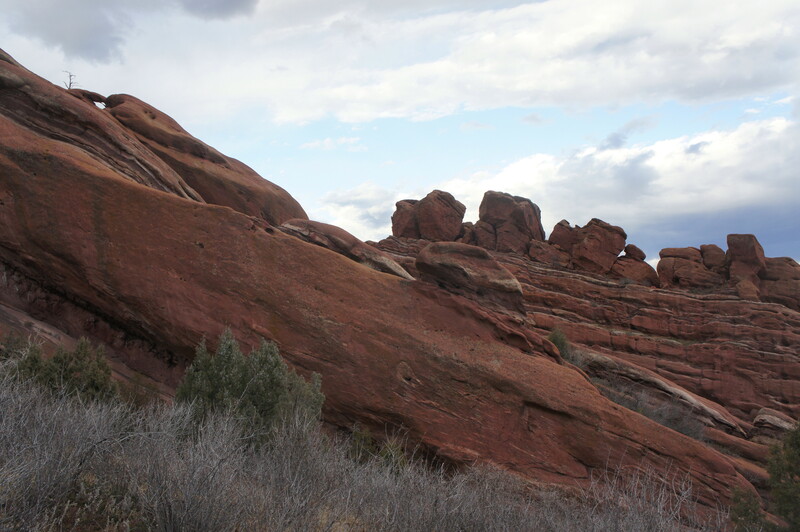 After initially swinging far from the sandstone outcrops, the path gradually approaches Frog Rock on the right and enters the hike’s most scenic section: a grassy passage between rock features. An optional loop splits from the main trail at around 1.1 miles, bearing east across a grassy meadow to the edge of hefty Frog Rock. The main track then approaches a set of interpretive signs; pictures and short descriptions of local features add context to the curiously-named rocks nearby: Sphinx, Gog and Magog, The Toad, Sinking Titanic, and Iceberg. After a subsequent trail fork (the optional loop enters from the right), the trail cuts left and enters a relatively narrow canyon. Sphinx Rock’s distinctive spire towers above, followed quickly by Sinking Titanic Rock and Iceberg Rock on the left. Swallowed up by cottonwoods and willows, the ravine cuts deeper as the trail crosses a dry wash. At 1.3 miles, stay right at the trail fork, then cross a short bridge and ascend a steep staircase that exits the gully and runs up against the walls of Nine Parks Rock, the final formation encountered on the hike. Stay right as a spur trail leads up to a parking area on the left; from here, the path turns into a sidewalk paralleling Ship Rock Road. As it approaches the Trading Post, the trail drops down a series of steps to the Red Rocks Native Garden, with the main building just beyond. Here the snarls of crowds and vehicle traffic set in again, a reminder of the park’s urban environs at trail’s end. 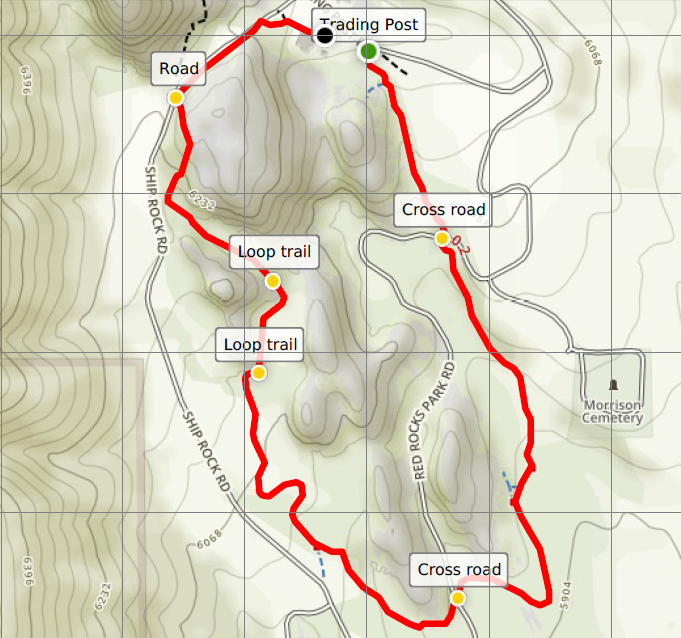 Allot 1-1.5 hours for this moderately difficult loop hike. 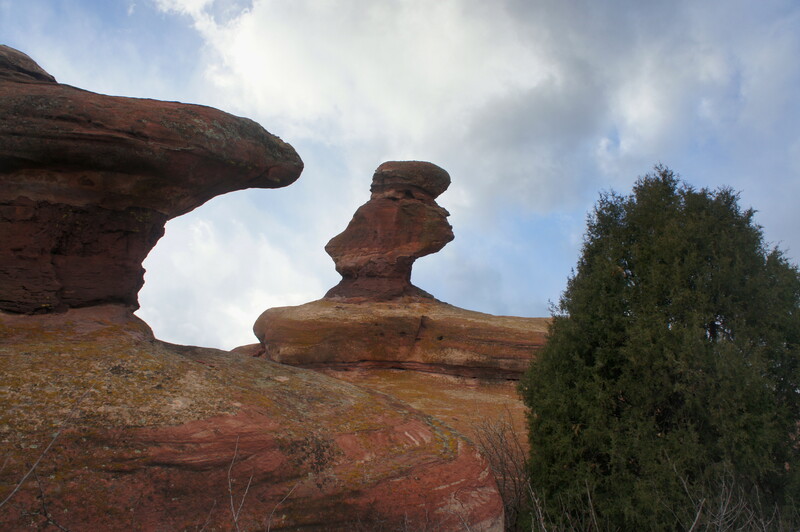 This entry was posted in Colorado, Jefferson County Parks, Moderate Hikes and tagged Colorado, Fountain Formation, Frog Rock, Iceberg Rock, loop hike, Nine Parks Rock, Picnic Rock, Red Rocks, Red Rocks Park, Sinking Titanic Rock, slickrock, Sphinx Rock, Trading Post, Trading Post Trail. Bookmark the permalink.